Asked by a fellow scribe how he interpreted the current scenario. “Satisfactory” was the short response. 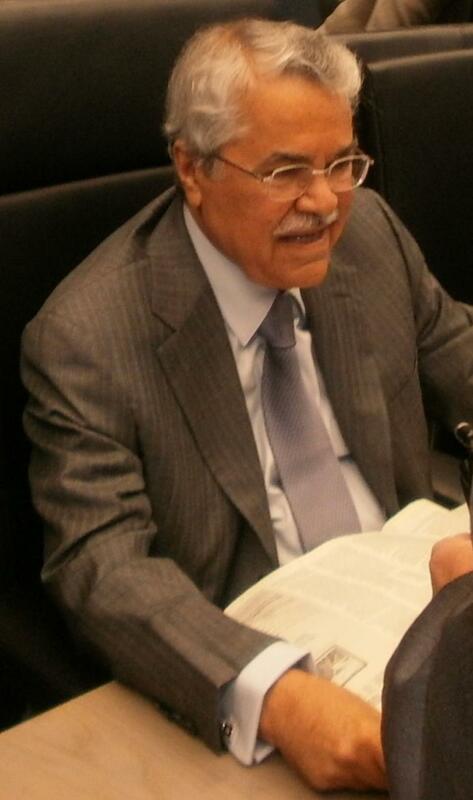 Al-Naimi also said, “Enough has been said on shale. North American shale production adds to supply adequacy. Is it a bad thing? No. Does it enter into the geopolitical equation and hegemony? Yes of course. Geopolitics has evolved for decades along with the oil industry and will continue to. What’s new here? !” And that, dear readers, was that. Despite being pressed for an answer several times, Al-Naimi declined to discuss the subject of choosing a successor to OPEC Secretary General Abdalla Salem El-Badri. The Saudis are expected to battle it out with the Iranians for the largely symbolic role, but one that is nonetheless central to shaping OPEC policies and carries a lot of prestige. As in December, the Saudis are proposing Majid Munif, an economist and former representative to OPEC. Tehran wants its man Gholam-Hussein Nozari, a former Iranian oil minister, installed. Compromise candidate could be Iraq’s Thamir Ghadban. The tussle between Iran and Saudi Arabia about the appointment has been simmering for a while and led to a stalemate in December. As a consequence, El-Badri’s term was extended. Anecdotal evidence suggests the Iranians, as usual, are being difficult. More so, Al-Naimi appeared to the Oilholic to be fairly relaxed about the Shale ruckus, but the Iranians are worried about perceived oversupply. (Only the Nigerians appear to be jumpier than them on the subject of shale). Iran's oil exports, it must be noted, are at their lowest since 2010 in wake sanction over its nuclear programme. Away from the tussle, Abdel Bari Ali Al-Arousi, oil minister of Libya and alternate President of the OPEC Conference, said the world oil demand growth forecast for 2013 is expected to increase by 0.8 million barrels per day (bpd). Total non-OPEC supply has seen a slight upward adjustment to 1.0 million bpd for the year. “This situation is likely to continue through the third and into the fourth quarters as we head into the driving season. Our focus will remain on doing all we can to provide stability in the market. This stability will benefit all stakeholders and contribute to growth in the world economy. However, as we have repeatedly said, this is not a job for OPEC alone. Every stakeholder has a part to play in achieving this,” he added. Rounding off this post, on the subject of hegemony, it always makes the Oilholic smirk and has done so for years, that the moment the scribes are let in - the first minister they rush for (yours truly included) is the man from Saudi Arabia. That says something about hegemony within OPEC. That's all for the moment from Vienna folks, updates throughout the day and the weekend! Keep reading, keep it 'crude'! © Gaurav Sharma 2013. Saudi Arabia’s oil minister Ali Al-Naimi speaking at the 163rd OPEC meeting of ministers © Gaurav Sharma, May 31, 2013.